Günter Mal is no lightweight when it comes to light bikes. His current steed, which he rides every day, sometimes up to 1,000 kilometers a week, weighs in at 3,195 grams. That's a seven pound bike, folks! Which would be impossible if not for Lew Racing's Pro VT-1 wheelset for which Paul Lew of Lew Racing created a special custom full boron set that weighs a miniscule 734 grams. But that wasn't light enough for Günter. He knocked off another 30 grams from the wheelset by machining the axel end caps, replacing the steel freehub pawls with titanium pawls, changing out the wheel hub spacers with titanium spacers, using tapered carbon/boron axles and Si3N4 full ceramic bearings. "While our stock 850 gram Pro VT-1 wheelset is made to fit a wide range of rider's weight up to 185 pounds, the boron set was designed and built specifically for Günter's 150 pound body," says Lew. "It was a fun project and makes us thrilled to know that we have built the lightest wheels in the world." For more information on Lew wheels, contact Lew Racing at (702) 581-5405 or go to http://www.lewracing.com. FYI: Lew Racing custom wheelsets sell for $15,000 MSRP. Paul Lew began designing and manufacturing bicycle wheels in 1991. 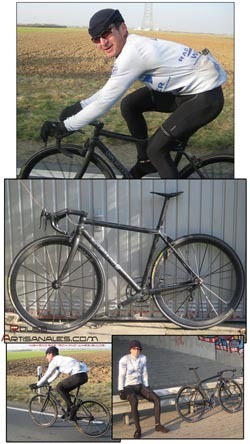 Eleven years ago he developed the Race Lite, a 34 Msi  carbon rim - the first and original unidirectional carbon fiber rim. Lew introduced his hybrid 34 Msi and 43 Msi carbon Sub One wheel in 1998 as the first production 1000 gram wheel set.